Which Birds Are Attracted to Cracked Corn? A common and useful food for birds, cracked corn is often overlooked or dismissed as an inferior birdseed filler. Because it is easily available and affordable, however, cracked corn is a great option for feeding many backyard birds. Cracked corn is exactly what it sounds like: corn kernels that have been dried and cracked into pieces that are easier for birds to eat than unbroken kernels. The size of grains can vary depending on what type of grinder is used to crack the corn, but coarse grinding is preferred for small backyard birds. While the dry corn can create a significant amount of dust, it will not grow or sprout can be a good no-waste bird food for cleaner backyard bird feeding. Because it is so dry, it can also be stored for long periods of time without significant spoiling. While cracked corn does not have a high oil percentage, it is rich in both protein and fiber and is an excellent supplemental food to offer backyard birds. It can be purchased at wild bird stores or agricultural centers that offer animal feed, and it is often used as a filler in birdseed mixes. Many different birds will eat cracked corn, and they are often larger species with hearty appetites. This makes this seed popular for offering as a way to distract these birds from more expensive seeds such as Nyjer or sunflower hearts. In addition to the many birds that will eat cracked corn, it is also a favorite food of other backyard wildlife, including deer, squirrels, chipmunks, and raccoons. This can make it a good seed to offer at separate wildlife feeders to distract them from bird feeders. Many birds that eat cracked corn are ground-feeding species, and it is best to sprinkle the corn directly on the ground in an open area of dirt, gravel or very short grass, or along a deck or patio. Sprinkling cracked corn under low bushes or shrubs will also help attract more secretive ground-feeding species such as towhees and quail. Birders who prefer to offer the seed in feeders can use large, open tray feeders or platform feeders. Ideally, the feeders should be only a few inches off the ground, but higher hopper feeders can be used if they include a large tray or shelf for larger birds to perch comfortably while feeding. Cracked corn can be fed to backyard birds by itself or mixed into other types of birdseed. 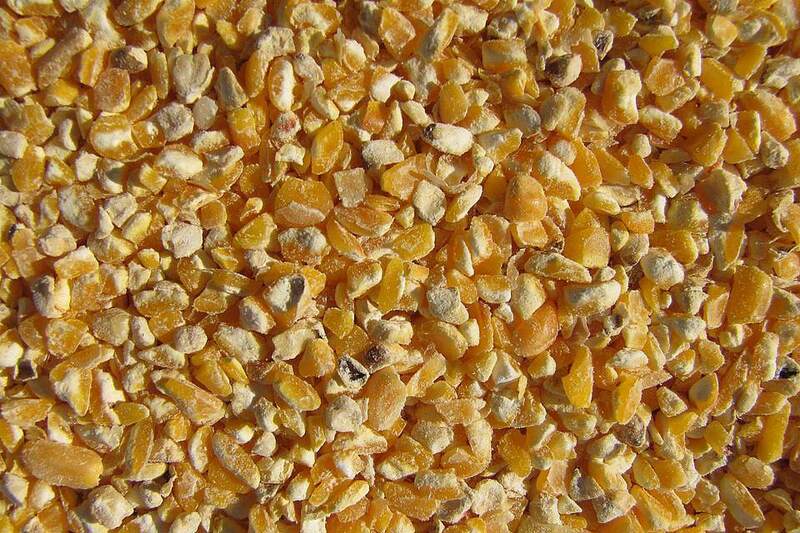 Birders who create their own birdseed mixes should keep the proportion of cracked corn minimal so it is not simply discarded by birds that are searching for different seeds. If you grow your own corn, it is possible to make cracked corn. After the corn is harvested, it should be thoroughly dried on the cob. Once dry, the corn can be shelled, removing the kernels from the cob. The kernels should then be ground in a grain grinder on a course, large setting. If no grinder is available, the dried kernels can be cracked by placing small quantities into a plastic zip bag and using a hammer to gently fracture them into pieces. Uncracked, dried kernels can also be included in birdseed mixes but will only be attractive to larger birds such as jays or turkeys. If you have a large quantity of dried corn you plan to crack for birdseed, it is best to store the corn on whole cobs, as it will last longer. Whole cobs can also be made available for squirrels and chipmunks, and large birds such as jays or grackles may peck at dried corn on cobs. Used wisely, cracked corn can be a favorite food of many sparrows and game birds, making it a valuable addition to a backyard buffet. If offered to give larger birds with larger appetites a less expensive meal, birders can use cracked corn to save money on birdseed by limiting pricier options at the feeders. Savvy birders who grow their own corn can even learn to crack it themselves, offering their backyard birds a healthy, inexpensive treat with ease.